Boxing Corner is committed to protecting your privacy. We can not and do not store any sensitive information from your credit / bank cards. 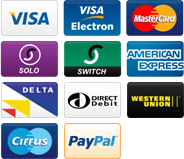 All online payments are handled by Paypal, which is one of the safest internet payment transaction companies in the world. Boxing Corner will NOT pass on any information of its customers to any third party companies for marketing purposes. Boxing Corner will only store basic information about you as per in accordance with the Data Protection Act 1998. The type of information we might collect includes, your name, address, phone number and email address. We aim to ensure that this information is accurate and up to date, However, if you see any inaccuracies please inform us as soon as possible via email to boxingcorner01@gmail.com and we will amend or delete the information promptly. You can also change basic information by using the My Account link on the Home Page. Boxing Corner may use technology to track patterns of behaviour of visitors to our site only. Boxing Corner will email a newsletter to all customers, with updates of new products and special offers occasionally. Some special offers may only last for 24 hours and only a limited stock will be available, the newsletter is an ideal way of staying in touch and taking advantage of such special offers. If you would prefer not to receive a newsletter you can unsubscribe by using the My Account link on the Home Page.